Today's "card," actually a cereal box back panel, retells one memorable inning from baseball's 2nd All-Star Game in 1934, played at New York's Polo Grounds. 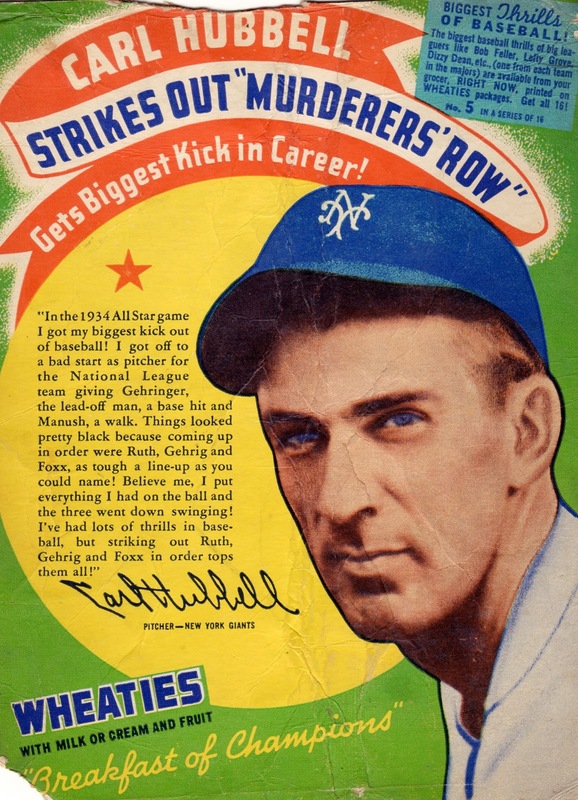 Starter Carl Hubbell allowed the first two men to reach, with Ruth, Gehrig, and Foxx coming to bat. This box tells the rest, with kid-like excitement. As a Giant at his home park, many of the game's 48K ticket holders would be rooting for Hubbell and I can only imagine the thrill in seeing all three sluggers strike out, with two HOFers (Al Simmons and Joe Cronin) following next inning. Check out the excellent "Wheaties and Sport" article at PopHistoryDig.com for a ton of Wheaties baseball history. It shows several of their box designs, pictured players, and related magazine ads. Value: A lot of Wheaties stars became HOFers, but low-grade panels don't cost that much, probably for lack of collector demand. I found Carl on eBay for $20 in 2004. Fakes / reprints: Haven't seen anyone fake a Wheaties panel. It would be tough, given the larger size and mix of colors.